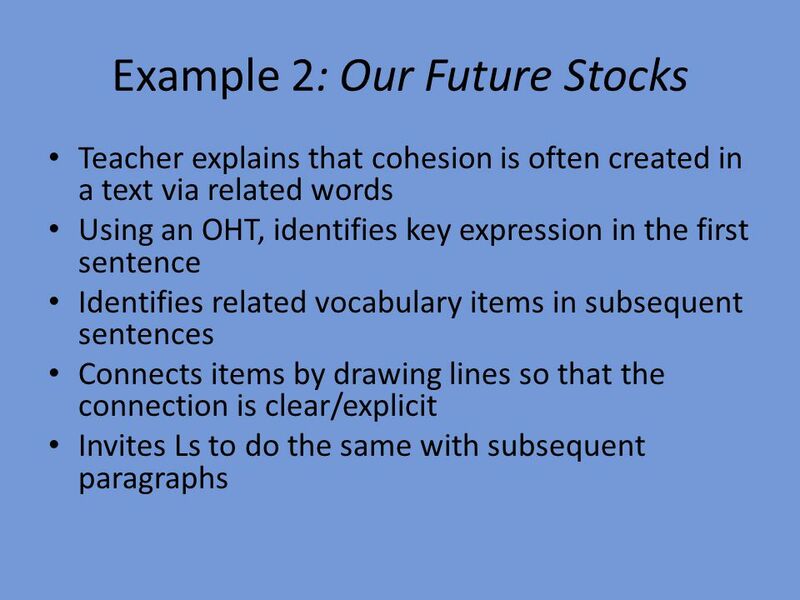 Students look at a ‘cohesive’ section of the text A) Ss determine what the key words are in this section. 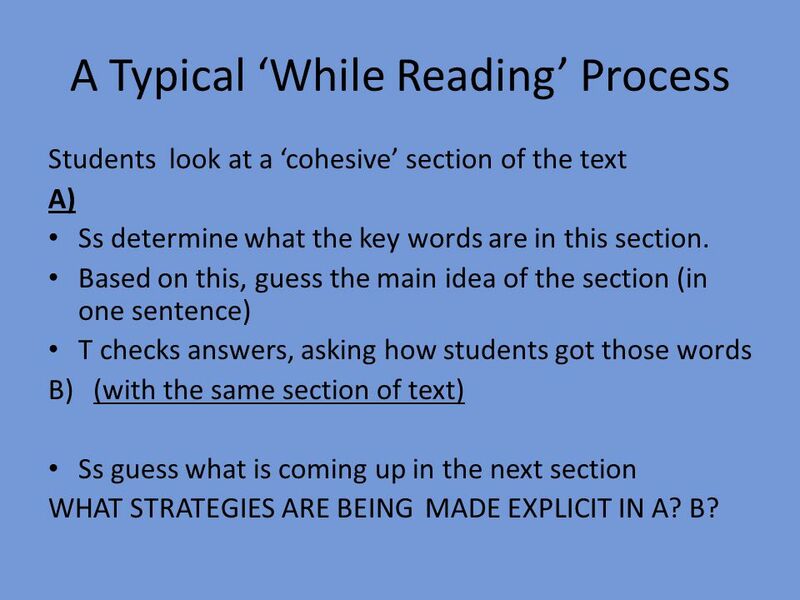 Based on this, guess the main idea of the section (in one sentence) T checks answers, asking how students got those words (with the same section of text) Ss guess what is coming up in the next section WHAT STRATEGIES ARE BEING MADE EXPLICIT IN A? B? 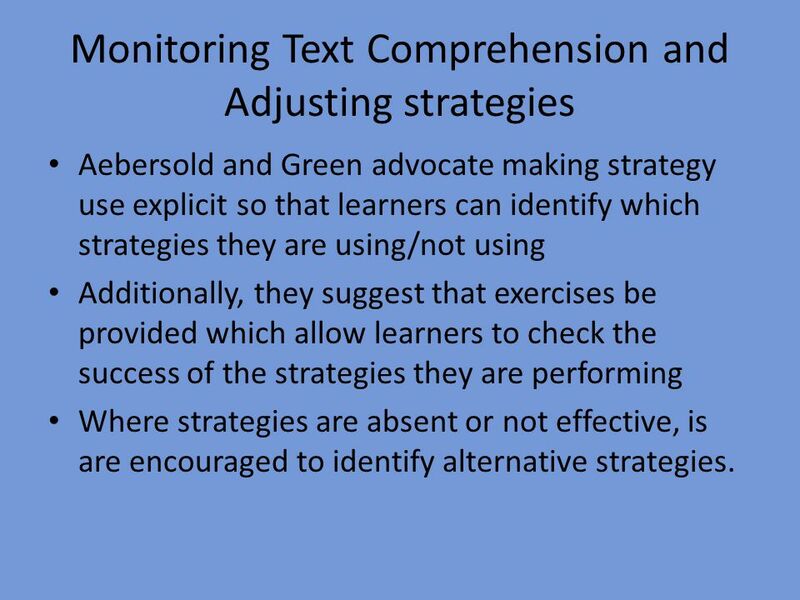 Aebersold and Green advocate making strategy use explicit so that learners can identify which strategies they are using/not using Additionally, they suggest that exercises be provided which allow learners to check the success of the strategies they are performing Where strategies are absent or not effective, is are encouraged to identify alternative strategies. 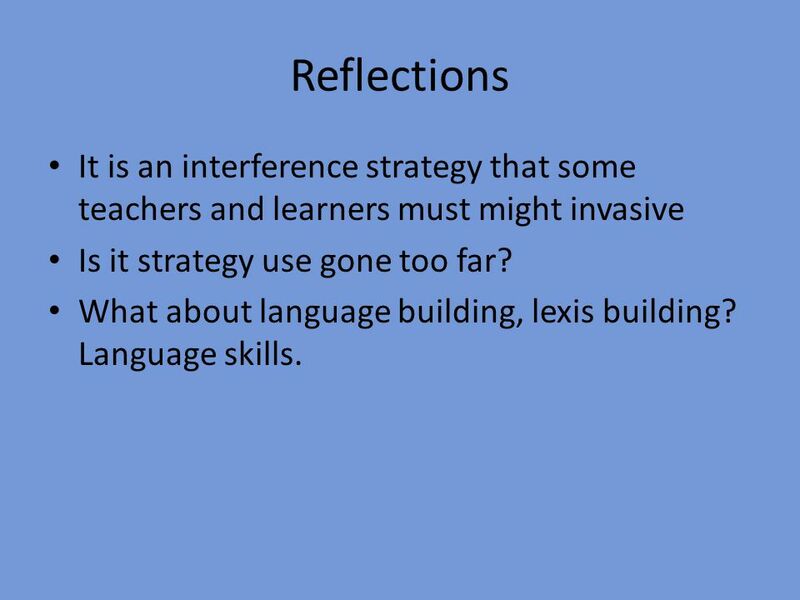 14 Reflections It is an interference strategy that some teachers and learners must might invasive Is it strategy use gone too far? 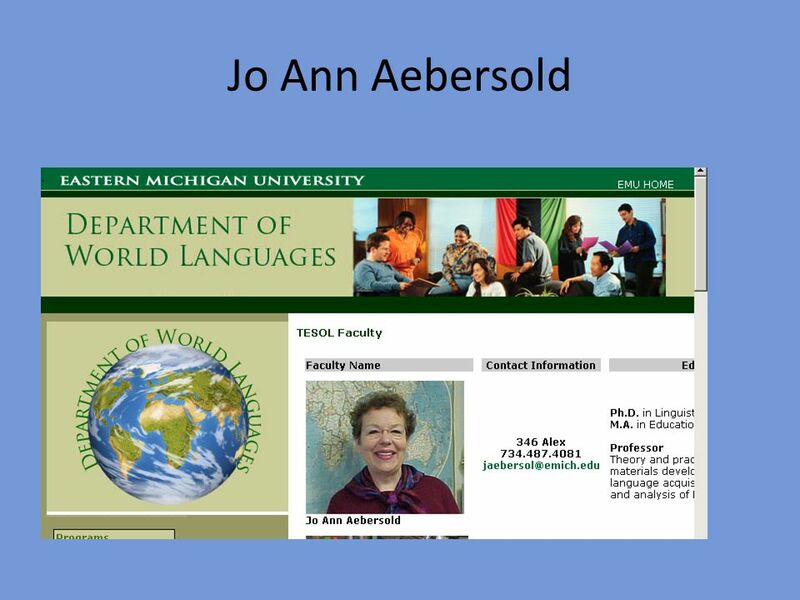 What about language building, lexis building? Language skills. 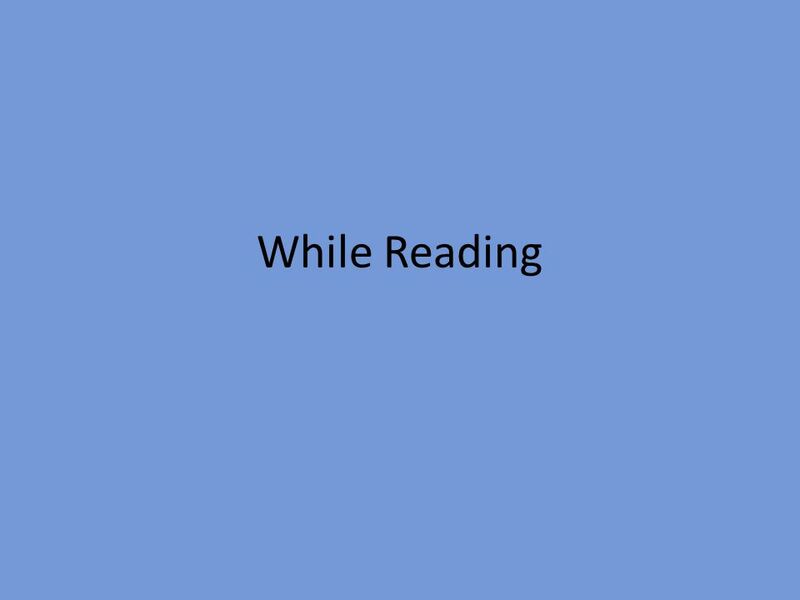 7 Chapter 14 Narrative Reading. 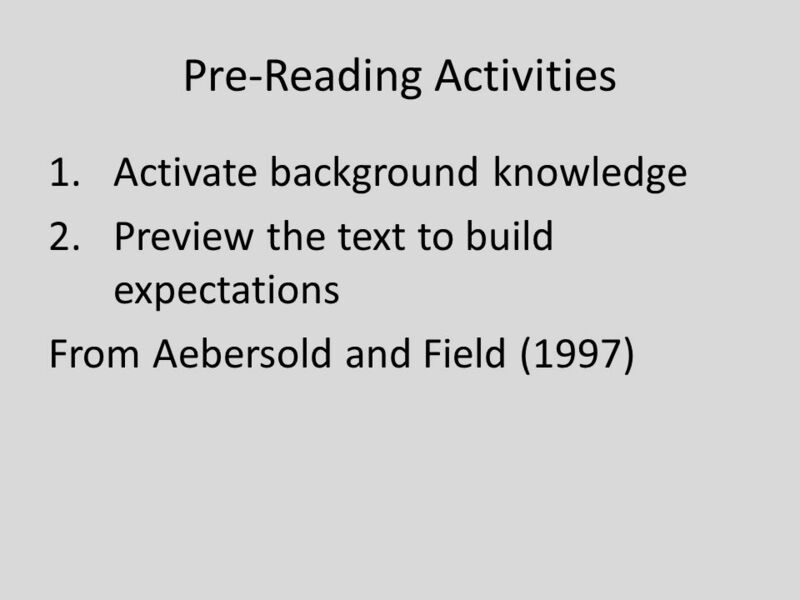 Comprehension 3 Elements of Comprehension: The Reader. GOOD MONDAY MORNING WELCOME TO ACADEMIC REVIEW Tuesday September 24th, 2014 WMDMS MORNING ANNOUNCMENTS Lunch menu Upcoming events at MDSM CHANNEL ONE NEWS. 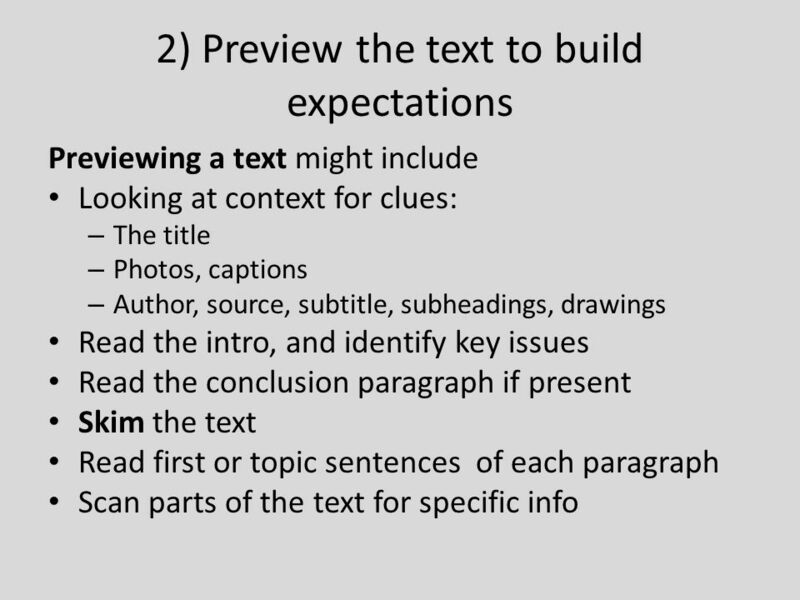 Unit 11 Teaching Reading. 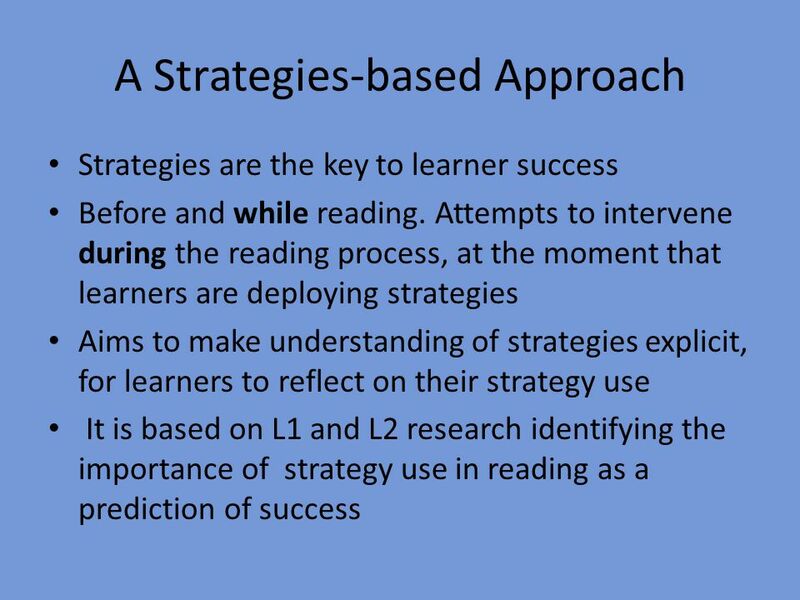 Teaching objectives  know how and what people read  grasp strategies involved in reading comprehension  know the role of. 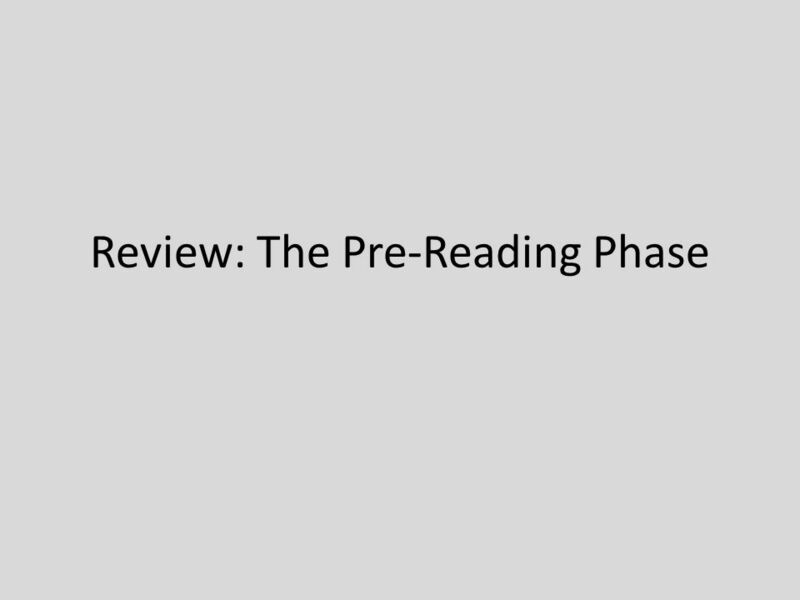 TEACHING RECEPTIVE SKILLS: LISTENING AND READING. What makes a good reader? How do you know you are one? 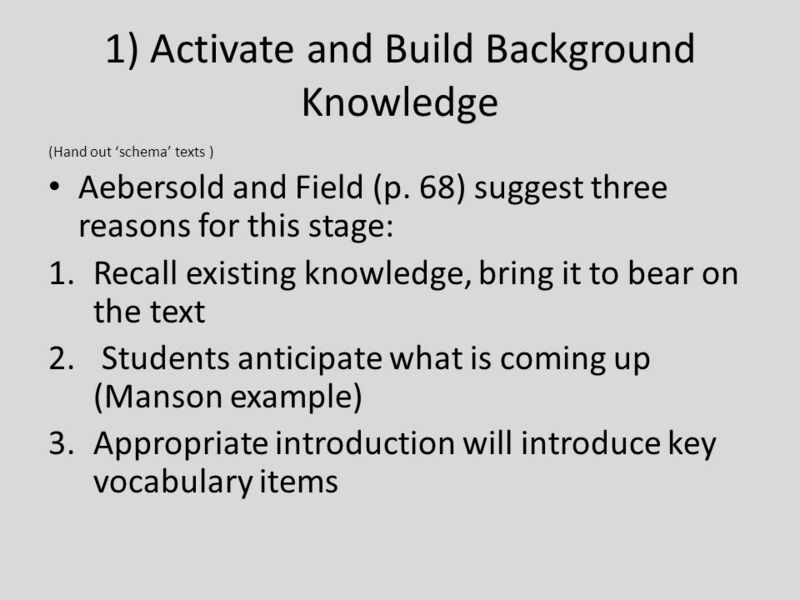 Section VI: Comprehension Teaching Reading Sourcebook 2 nd edition. is a receptive skill can be described as the process of extracting meaning from printed or written material. Non-Fiction Text Structures and Before, During, and After Reading Strategies. 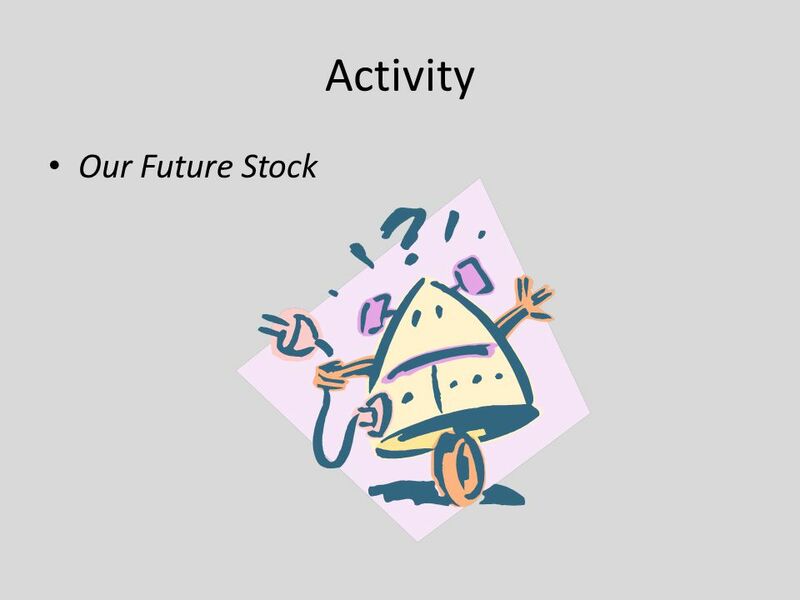 Preview Strategy Before you read – Brainstorm and Predict 1. Think about the topic of the passage. 2. Write down everything you already know on the Learning. Welcome to Business Skills Center Welcome greeting Open hours and dates logo Home Page Link to various sites Add/drop Home Instructor BUSC Selection Take. Timing: 60 minutes (about 15 minutes for each passage). Passages: 3 passages ( words) - each one followed by 12 to 14 questions.